We are committed to provide you with an exciting selection of fine Judaica while not compromising on price and customer service. If you would compare our prices to those of other companies you will find that our low pricing attitude is outstanding! 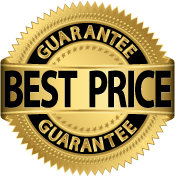 However, since we handle thousands of items you might find a source that offers you a better deal on a particular item, that's why we offer a price guarantee which in most cases will meet or beat any price out there. Our guarantee to our customers; If you are offered a better price by any other legitimate company, upon request, we will do our best to meet or beat it. By Phone: 1800-336-2291 Tell the rep. you are calling for a better price. Via Email:sales@zionjudaica.com Tell us which item you are interested in, where have you seen it, and for what price. We will not match the price if the lower price is offered directly from the manufacturer of the product (some companies have no ethics and don't protect the very people who keep them in business). We will match or beat a price only after taking in account the competitors shipping rate, i.e. if the other company has a higher shipping rate than us we will add that amount to their price and then match it to ours. Price guarantee must be discussed prior to placing the order; we will not go back and adjust prices after the order is submitted. If we feel that the other place has an unreasonable price, we reserve the right to contact that company and verify if that price is indeed correct and not a typographic error. Shop with confidence at the world's largest Judaica source, no where will you find this selection at these prices.